A new Technology Business Incubator (TBI) of the famous Entrepreneur Development Institute of India (EDII) is all set launch, known as the Centre for Advancing and Launching Enterprises (CrAdLE), to support entrepreneurs in getting their new businesses started. The ambitious plan aims to work with about 40 startups in a course of three years. Each of these budding companies would be expected to create 100 jobs each, thereby creating over 4000 jobs in all. CrAdLE will have Infosys co-founder Kris Gopalakrishnan as its first chairman of its advisory committee. The board would comprise of seasoned entrepreneurs, technologists, venture capitalists, academicians and other professionals from the specific domains that the centre aims at promoting. Businesses will therefore benefit immensely from specialized knowledge and the right technological support for smart organization, communication and selling. In addition, enterprises incubating in CrAdLE will go through review parameters to give them an exact measure of growth they have witnessed in various stages. 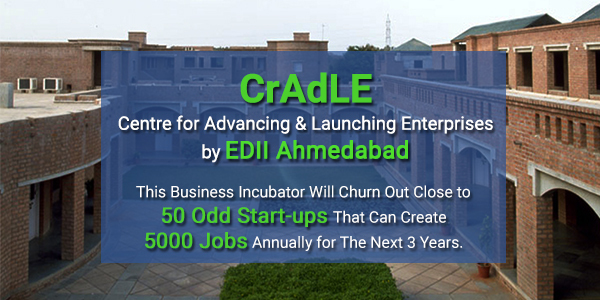 CrAdLE will be set up at EDII’s Ahmedabad campus, and a space of 10,000 square feet has been marked for the same. The centre should be up and about in a matter of a few weeks now. Its main focus, as of now, is to help nourish businesses in four sectors: manufacturing, healthcare, renewable energy and food and agriculture. Gujarat is recognized to have a sizeable number of naturally entrepreneurial people and Ahmadabad shows fine signs of becoming India’s next start-up hub particularly in the non-IT sectors. With the right institutional support, businesses started here can thrive not only in India but in international markets as well. Gopalakrishnan believes EDII’s TDI to be an excellent resource for entrepreneurs, especially at this point of time when there is a most conducive climate of encouragement to new enterprises coming from the PM himself. Besides facilitating the essential hand-holding to companies in their nascent stages towards a seamless commercialization of ideas, knowledge and technologies, CrAdLE will also provide assistance in legal, financial and technical matters. Moreover, all entrepreneurs who are part of the program will have access to additional sources of funding besides a fund of Rs. 10 crore from the DST for 5 years.